Broderson is an industry leader in Carry Deck Cranes for Industrial Use. These cranes are specially designed and built for operation in tight quarters where overhead obstacles are common: for industrial settings such as plants, refineries, mining operations, and manufacturing facilities. The Carry Deck design is available in lift capacities from 2 tons on up to 25 tons. The maximum capacity 25 ton IC-400-3A is one of several 2019 additions to this versatile line, featuring a maximum jib length of 75 feet, 360-degree Continuous Boom Rotation, and the always reliable Cummins Diesel Engine, the stalwart power source of much of the Broderson line. For smaller loads and even tighter quarters, the Broderson IC-20-1K, with 3-ton capacity and Kubota D1803 Diesel Engine, is available. For industrial lifts from 2 tons up to 25 tons, there is a Broderson Carry Deck Crane to fit your exact specifications and needs. These cranes feature precision instruments, robust booms, and customized options if desired. Broderson manufactures a crew of quality Rough Terrain Cranes suitable for any need as well. These Rough Terrain Cranes go anywhere a crane can possibly go. They feature rugged construction for harsh conditions, including oversized rough terrain tires, three steering modes, ease of setup, high ground clearance, and durable, comfortable, ergonomic cabs and controls. The RT-400 is the latest addition to this versatile, rugged line, featuring the Cummins 4.5L Turbo Diesel with Tier 4 compliancy, 20-ton maximum capacity, telescoping boom even under load, 68-foot boom length, and 20-foot jib extension. Broderson Rough Terrain Cranes have numerous advantages, including versatility, suitability for pick and carry operations and optimization for road transport to the job site. Whether for industrial use or in rough terrain, Broderson brings the highest quality of one of the finest manufacturers of crane equipment in the world to your project. A Scott-Macon maintenance program is available to ensure continued quality Broderson Crane performance. We stock a complete line of Broderson parts. Scott-Macon Equipment backs the Broderson Cranes with 24/7 service support centers throughout Texas, Louisiana, and Oklahoma. 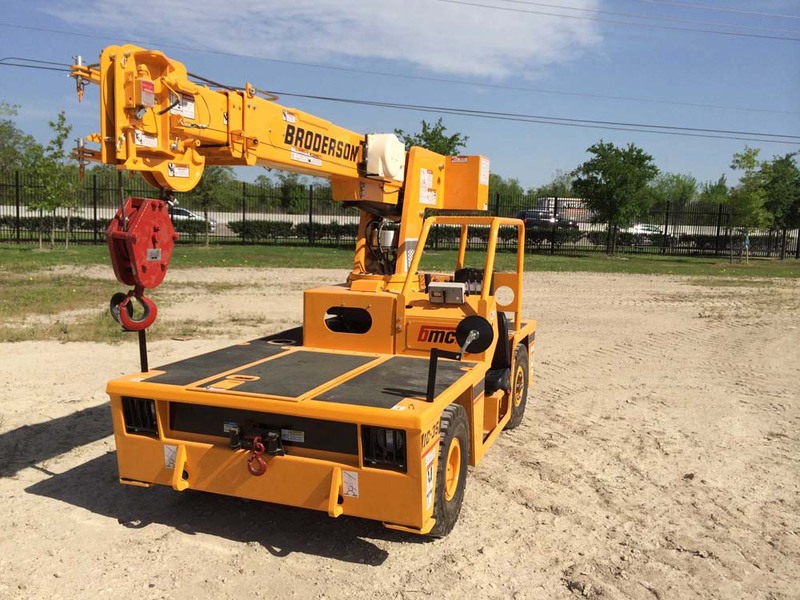 Scott-Macon also handles sales and rentals for the Broderson cranes. We can help you determine which Broderson Crane is the best fit for your job site and whether purchase or Broderson crane rental is most effective for your particular situation. Our rental fleet of cranes is one of the largest in North America, and our reputation has been built on timely, efficient service support. Contact us today for more information on a Broderson crane purchase or rental.